Families across the United States are facing a child care crisis, but African American families are especially hard hit by the rising cost of child care and limited options for working families. Today, three in four African American children under age 6 have all residential parents in the workforce. By comparison, the rate is only 63 percent for non-African American children. For decades, African American women have worked at higher rates than other women, meaning that child care has long been a necessity for these families. According to the U.S. Census Bureau, the majority of children under age 5 are children of color. These demographic trends provide a glimpse into the future—one in which the American educational systems and workforce will feature increasing racial and ethnic diversity. By 2044, more than half of all Americans are projected to be people of color. Policymakers must take steps now to acknowledge and address the child care challenges that families of color face so that their children can find success in the workforce of tomorrow. While researchers repeatedly affirm the deep and long-lasting developmental benefits of high-quality early care and education, the supply of affordable, quality options for all families remains distressingly low. Even when high-quality child care is available, the price can exceed the cost of median rent or even college tuition. The average annual cost of center-based child care for an infant and a 4-year-old is nearly $18,000, which amounts to 42 percent of the median income for a typical African American family. And while African American parents are more likely to work, they earn 40 percent less on average than non-Hispanic white families. Black parents find themselves in an impossible situation: Child care is an urgent need, but they have fewer resources with which to purchase care. Coping with the child care dilemma can be difficult and time-consuming for most parents but is particularly so for African American parents. When faced with the high cost of child care, some parents may consider leaving the workforce temporarily. However, leaving the workforce costs parents not only their lost wages but also future wage growth and retirement assets, including Social Security. For a parent earning $30,000 per year, quality child care for two kids is simply out of reach, so dropping out of the workforce may seem like an attractive option. However, a recent CAP analysis of the hidden, long-term costs of this choice shows that interrupting a career costs much more than just the parent’s lost wages. For example, a 27-year-old African American woman earning the median income of $35,100 would lose more than half a million dollars in lifetime income by leaving the workforce for five years—$175,500 in lost wages, about $195,000 in lost wage growth, and $165,000 in lost retirement savings and benefits. This amounts to a 20 percent reduction in her lifetime earnings and is three times more than the rule-of-thumb wage loss that she might have estimated as five years of sacrificed income. With such difficult choices for families—and in particular African American families who are doubly penalized by lower wages and higher rates of parental labor force participation—policymakers must take steps to ease the child care burden. A recent poll commissioned by the Center for American Progress, which surveyed women of color in the battleground states of Florida, Nevada, Colorado and Virginia, found that access to child care is an important issue for African American women. When asked—“What are two of the most important issues that politicians should address?”—25 percent of respondents listed access to affordable child care. Additionally, 73 percent of African American women in these states felt that a universal public preschool program guaranteeing every 3- and 4- year-old access to high-quality early education would help people like them. High-quality child care benefits the whole of society and its effects can last a lifetime. Children who attend quality child care programs are more likely to have future educational success, more likely to be employed, and are more likely to develop positive social and emotional skills than those who do not attend similar programs. Unfortunately for far too many families, whether they are families of color or not, high-quality child care is simply unaffordable. When policymakers debate how to spend resources efficiently, they should note that the president’s Council of Economic Advisers found a return on investment of $8.60 for every dollar spent on early childhood. About half of that economic benefit comes in the form of higher earnings for today’s children when they enter the workforce of tomorrow. In order to keep the nation’s workforce competitive in the future, policymakers must focus on providing supports for the families that most need quality child care options. 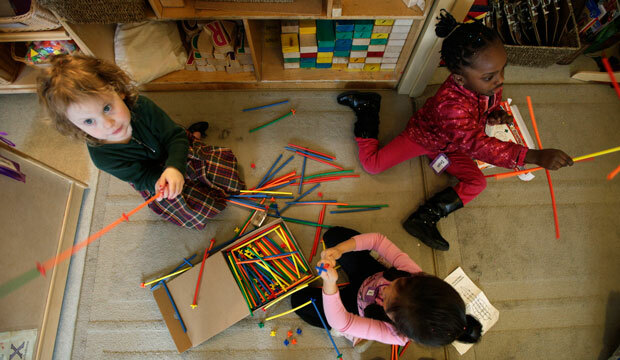 American families of color are calling on their leaders to address the child care crisis. By acknowledging the racial disparities in how much families work and earn, they can effectively invest in shared prosperity for all. For more information on how much money parents lose when they leave the workforce due to expensive child care, visit “The Hidden Cost of a Failing Child Care System.” To learn more about the current state of early learning programs in your state, see the state and District of Columbia fact sheets here. Rasheed Malik is a Policy Analyst on the Early Childhood Policy team at the Center for American Progress. Jamal Hagler is a Research Assistant on the Progress 2050 team at the Center.